I make this recipe with both beef and lamb, but have included lamb as the primary meat source just out of respect since I am calling this an ‘Indian’ recipe. But you can even make it with ground turkey or chicken with outstanding results! 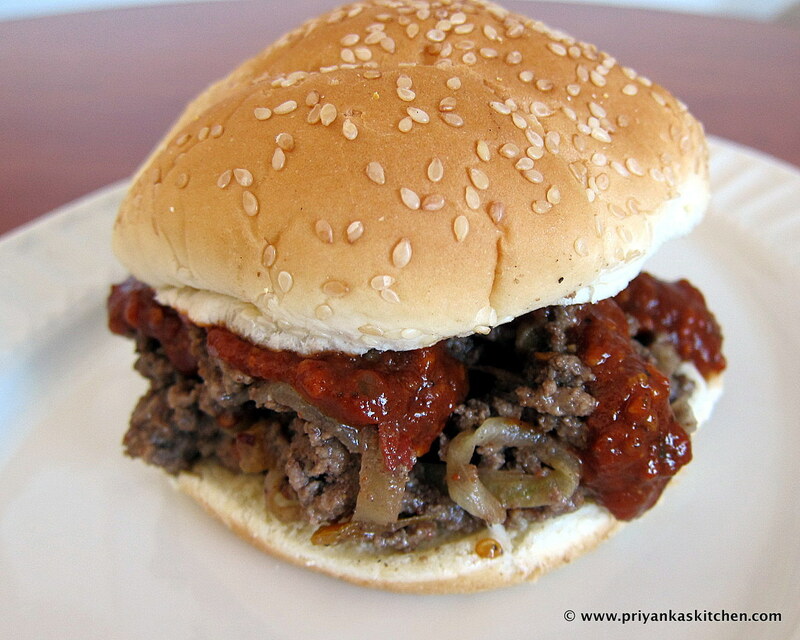 I think it is lovely with beef and lamb (the red meat flavors really make you believe you are eating a true sloppy joe! ), but either way is great. Heat the vegetable oil in your saucepan over medium-high heat. Add the ginger, garlic and chopped green chili. Saute slightly browned, about 2 minutes. Now add the garam masala and paprika and sauté for 30 seconds until fragrant. Stir in the tomato sauce, tomato paste, and water. Bring to a boil, then reduce the heat and simmer, uncovered, until thickened, about 10-15 minutes. Keep warm. Heat 3 tablespoons of vegetable oil in a large skillet and add the cumin seeds (or cumin powder) and all-spice and cook for about 20-30 Now add chopped onions and bell pepper, stirring occasionally until softened and starting to brown. Add the chili pepper. Sauté for another 2-3 minutes. Add salt, ground lamb, Worcestershire, cilantro, & black pepper. Using a wooden spoon, break up the lamb and incorporate all ingredients well. Let it cook for about 5-7 minutes until the meat is no longer pink and browned. Continue to use the wooden spoon to break up the beef into smaller pieces. Now add the honey, half-and-half, and toasted cashews, stirring throughly. Taste for seasoning and adjust as desired. Take pan off of heat and set aside. Toast the hamburger buns on a preheated grill pan or on a skillet. Fill with the meat mixture, top with the spicy tomato sauce and serve. My favorite way to serve this burger is to garnish with fresh red onion for a bit of crunch and fresh cilantro. This dish is awesome to bring along to a picnic and eat with some baguette. 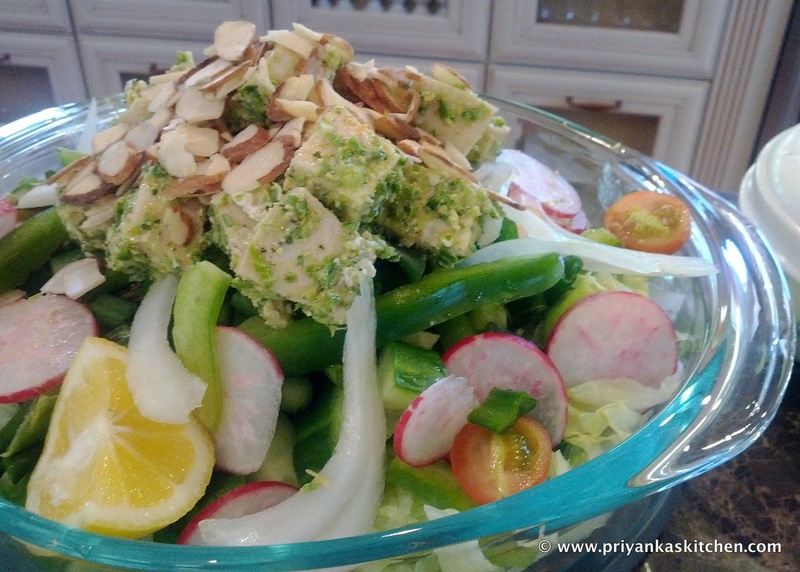 Or, add this to a fresh green salad instead of grilled chicken! Most stores sell a ready-made chicken salad that has tons of mayo and is way too rich – this is a new, healthy spin on the ‘meat salad’ idea and you can even make sandwiches with this for your kids and family! Mix all of the ingredients in a bowl until well incorporated. Taste for seasonings and adjust as desired.